Hello! Does anyone have any tips for placing the page to be printed on? Everything I can find is a very eye-balling "line the corner up with the pen", but our prints keep ending up being at an angle or running off the edge. Any ideas/tips? First, it's helpful to stand above the machine, to the extent possible, while setting the pen and paper position. It's easy to get some degree of error just from basic parallax, and keeping yourself higher (or the machine lower) can help. One way to check if the top edge of the paper is parallel with the machine is to turn off motors and manually slide the carriage horizontally along the rail. If there's a tilt between the two, you'll see it this way. For rapid repositioning of the clip easel, we have sometimes used a rectangular piece of material (e.g., wood) as a spacer between the central strut of the AxiDraw V3 and the top of the easel. The actual width of the piece of material that you'll need depends on a few factors including the exact version of the AxiDraw (there have been a few minor iterations on the pen holder) and the size of the pen that you're using. Similarly, you can place a fixed endstop on the left side of the easel, to assist left-to-right positioning. To check that the pen tip is actually above the corner of the paper, you can place a scrap of paper above the upper left corner of the paper and then lower and raise the pen to make a dot, so that you can check its location. A common cause of running off the page is not really having the _tip_ of the pen above the corner of the paper. If you're working on a surface that you can mark up (e.g., a benchtop with a white paper liner, or a stainless steel table top that can be cleaned with alcohol), you can place a marker in the AxiDraw and have it draw a rectangle equal to your page size, which can be a good guide for placing your paper. If you don't want to mark up the table, some masking tape (or blue painters tape) can serve as an excellent way to mark up your standard paper location. Finally, it's worth thinking for a moment about pen positioning. If you're using the vertical orientation for your pens, then the upper-left corner location tends to be very consistent (within pens of the same diameter). However if you have the pen holder in the diagonal configuration, then the left-right position of the pen can vary when you reposition it. It may be helpful to try to position the pen at the same height each time. These are awesome tips. Thank you! I went to Walmart, found a metallic whiteboard, and bought some magnets. 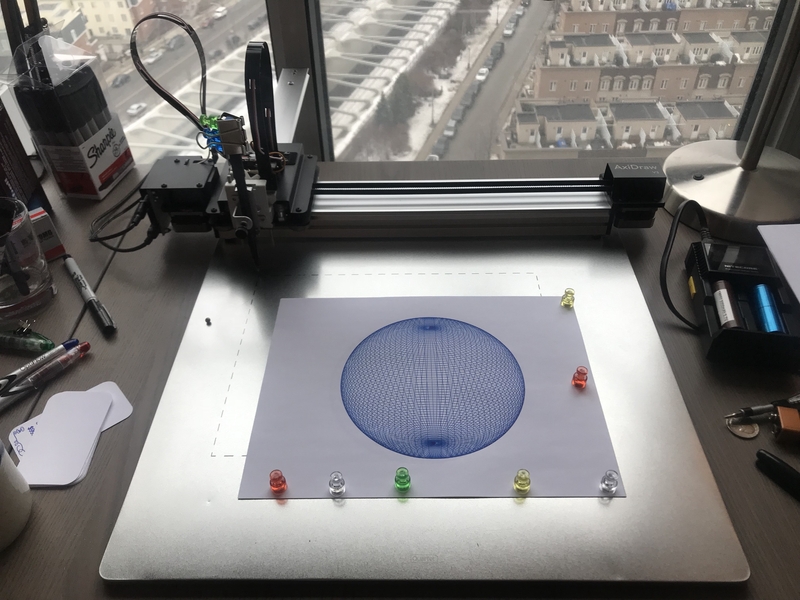 The Axidraw sits perfectly on the metal board, and I used an 8.5x11 SVG of a dotted stroke to plot the drawing area of the axidraw, and use magnets to quickly position my paper.